Abandoned calls are inevitable. Meaning that whether we want it or not, they happen. But fortunately, there are some great solutions which we can take advantage of to take down the number of abandoned calls to some acceptable values. Why I’m saying ‘acceptable values’? Does it mean that we can’t manage to tend it to zero? Of course, we could. But, it’s not worth it and it’s not necessary. Experts and professionals have, thankfully, guided us to keep our businesses and companies call abandonment rate within the discovered range known as Optimal Range. It’s believed that if directors manage to keep their phone call abandonment rate within this range, they could certainly have the highest levels of services and customer satisfaction. It doesn’t matter who you are and what you’re doing exactly. Companies, small and large businesses, educational institutions, banks, organizations must try to keep their call abandonment rate between 4-percent to 8-percent values. This is what’s known as the Optimal Range. I’ve already talked about the optimal range in full details in one of my previous posts, which you can learn more about by clicking here. Assuming that we are all on the same page and know a lot about abandonment rate, its direct relation with customer satisfaction, optimal range and everything, now it’s time to explore some of the main reasons which cause high rates in companies. So, this is going to be the whole purpose of this article actually. No matter what Call Management and Analysis service you’re using, it must have a widget or tool for measuring your company or department abandonment rate. On PBXDom, there is a widget which goes by the name Abandoned Calls Percent, which does the job for you. If you are a PBXDom user, then you can go ahead and add Abandoned Calls Percent widget to one of your dashboards and monitor this value. Now depending on your current call abandonment rate, then we decide what we need to do next. A low number of landlines/Trunks is recognized as one of the causes of the high call abandonment rate, poor performance, and low customer satisfaction level in help desks, and call centers. Therefore, we really need to make sure that the number of main landlines in your company is adequate. Some of the call accounting and monitoring applications like PBXDom provide you with some widgets to know about your landline/Trunk capacity and call handling during the day. The offered tools for most of these applications even enable you to determine the peak hours in your company and help you decide confidently to add more landlines to better handle your received calls. As inadequacy implies, it both means low in quantity and quality. Having a low number of employees, as well as incapable ones can be the other reason for poor performance and high call abandonment rate. As soon as you become certain to add more landlines, then it requires you to hire more staff and employees and properly train them to get prepared for answering your calls. But the downside of adding more landlines and recruiting more employees is that it ends up increasing up your costs. But this cost is inevitable if your call abandonment rate value is way beyond the optimal range. Let’s say, for example, 30 percent or even more. Long non-optimized conversation handle time has always been one of the roots of having abandoned calls and high bills. Good to know that handle time, by itself, is a Key Performance Indicator (KPI). After determining the right number of landlines, employees and finding out about the busiest hours in companies and businesses, then comes the conversation handle time. It’s really necessary to be watchful of the average handle time in your company and train and ask your agents to handle the conversations in the most optimized time possible. Especially, if your rate is a few percents away from the optimal range. In fact, if your range falls very close to or within the optimal range, it would be costly to add more landlines and agents to compensate for the remaining percents to reach the optimal range. 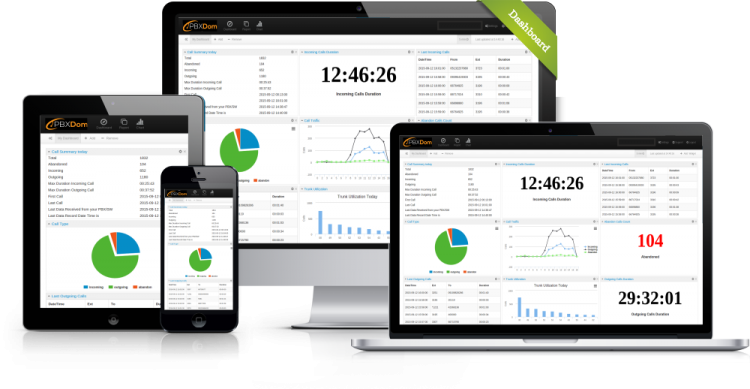 Again, most of the call accounting and monitoring services provide you with some widgets and tools to manage your handle time. PBXDom has a wealth of widgets which can be mainly and primarily used for this purpose. In the upcoming parts, I’ll dig a little bit deeper into what I’ve talked about and even introduce you to some of the widgets which can be used by the managers to take down the rate lower or keep it within the optimal range. If you have any questions, you can contact PBXDom team via email, online chat, or at our toll-free phone number. We’ll be glad to hear from you.